50/50/50 Challenge | Ooh Something Shiny! I’m a little reluctant to put this out there since it is pretty ambitious. My birthday is on the ninth. I will be 49 which means that I will be entering my 50th year. My goal this year is to complete my own 50/50/50 Challenge. I want to knit 50 scarves, read 50 books and lose 50 pounds. All while learning to play the cello and writing a full-length play. Oh and I work full time and have a house and family to take care of. 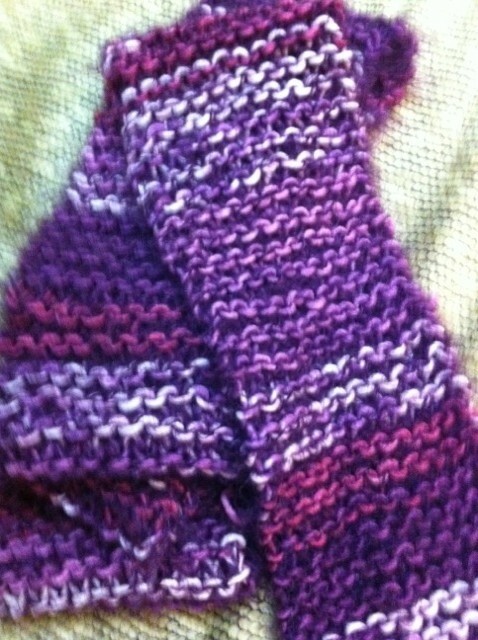 Here’s a picture of scarf number one. I’ll check in once a week or so. I figure that worst thing that can happen is that I only get to 20 or 30 of each, still nothing to sneeze at. Something will have to go though, so I think trash television and mindless surfing will have to be a thing of the past. ← Black Friday Campout? I Don’t Think So. I LOVE the colors on this. As far as I’m concerned, you don’t have to make any more. I’m tired just thinking about it but I think you can do it. Love that scarf! What are you going to do with the scarves you make? Thanks. I’m going to donate them before Christmas next year. Wait. WHAT kind of dog? Hated my job. Left. Now what? Straight Toque With Tami, Eh?